The big news story last week was obviously the Toronto Star’s detailed investigation into Rob Ford’s alleged problems with substance abuse. Thus far, Ford’s office has not debunked any of the article’s facts. Instead, it has chosen to unleash ad hominem attacks on those involved, like the Star and (former?) ally Paul Ainslie (Ward 43, Scarborough East). With Rob busy at the Beaches Easter Parade, what tack will Doug take? Find out next! 1:07: Happy Easter, folks! Happy Passover! Doug tells us Rob personally pays for thousands of Easter eggs. What a guy, sharing his millionaire wealth by buying chocolate. 1:09: Doug says there’s nothing he and Rob like more than being out there with the people. After all, Rob is the Mayor of all the people, Doug adds. He goes on to say that at the Good Friday procession in Little Italy, the number-one comment he heard was “**** the Star.” People, this is not proper Good Friday language. Jesus would be sad. 1:10: Doug argues that the Star wanted to kill the Fords politically the moment Rob announced an end to the gravy train. Of course, it was when Michael Cooke became editor of the Star in 2009 that the paper started running front-page coverage of Sandra Bussin’s decision to charge a bunny suit for the Beaches Easter Parade to her office expense account, along with other Rob Ford–friendly news. But whatever, let’s not let reality get in the way of our fun. 1:12: Doug draws a Rosie DiManno-worthy analogy: the Star, he says, is at war with Rob. But don’t worry, the people of Toronto are ammunition for the Fords. Pew pew! Pew pew! 1:14: Doug Ford is now reading Michael Cooke’s Wikipedia profile, presumably because he is completing a grade-five assignment: “The Person I Hate the Most.” He reads a Cooke quotation about newspaper rivalries: “We put our foot on their throat every day and press down till their eyes bulge and leak blood, but still they won’t die. We just have to keep at it till they do die.” This, says Doug, is indicative of the Star‘s character. Okay, let’s play this game. Oh, this is a fun game! Say more things, Doug. 1:15: Doug blames Cooke for using tabloid-style journalism in Chicago. I agree, tabloid journalism is hellish. 1:16: Doug points to Torstar’s decline in revenue as a sign that the Star’s tactics aren’t working. Actually, Star readership is up, although advertising is down across the board in print media. Torstar’s particularly bad quarter was due in part to romance publisher Harlequin not meeting expectations, as Fifty Shades of Grey dominated the market. I guess we should be thankful we aren’t listening to Doug discussing Fifty Shades of Grey. 1:16: Doug, foe of irony, says that the people see through personal attacks, and so the Star’s journalism won’t work. 1:19: Doug says the Toronto Star hates Toronto being open for business and getting rid of gravy and puppies and kittens. Whoa, it all makes sense now. 1:20: Former heavyweight boxer George Chuvalo, who once fought Muhammad Ali at Maple Leaf Gardens, joins the show. He was given the key to the city by the mayor last Tuesday, a ceremony that was marred by the fact that the mayor did not address the substance-abuse allegations beforehand. With that said, Chuvalo has a remarkable story, both athletic and personal, and is worthy of attention and admiration. 1:42: Doug says he “loves this song,” referring to “YMCA.” “It’s the old disco song, isn’t it?” he adds. 1:43: We are now talking pandas. I hope there are panda puns. 1:45: Doug says the pandas are sure to be a hit, as Toronto has a sizable Chinese population. No Doug, pandas are sure to be a hit because they’re super adorable, okay? 2:00: There was only one panda pun in that segment. These are not my people. 2:05: Councillor Peter Milczyn (Ward 5, Etobicoke-Lakeshore) is now on the show, and he and Doug are discussing the City’s harmonized zoning by-law process. While Milczyn doesn’t make for the most exciting radio, he has provided some of the best policy discussions on this show in the past. 2:15: Rob calls in from the Beaches Easter Parade, where he is presumably throwing chocolate into the crowd. Doug admonishes him to not slip on any eggs; last year Rob threw out his back at this parade. 2:25: Richard from Milton calls in, and wants Doug to run for Premier of Ontario. No, Richard, no. 2:32: It’s Pat on line two, and Doug lets him know that he’s on the number-one talk show in this time slot in the country. I’m not sure if that’s true, but I do know that when I researched this recent Grid graphic I learned that in December the show rated eighth in Toronto among all formats in that time slot. So there’s that. Pat says Rob and Doug are the antithesis of politicians, and he’s glad they’re around to deal with the nuts on council and downtown elites. 2:37: Doug is calling out Metrolinx, saying that the agency is going to destroy Sheppard and Eglinton Avenues. He implores the mighty Ford Nation to get in touch with their councillors. 2:42: Doug gives Rob credit for increasing funding to the arts. In fact, this was due to a decade-long grassroots initiative aimed at using billboard-tax proceeds for the purpose. 2:45: Doug says a journalist called an old work associate and asked all sorts of questions about Rob, their brother Randy, and their sister. “Is that journalism?” asks Doug. Yes, Doug, it is. 2:50: A caller unleashes a great Fordian slip, referring to Ward 34’s councillor as Denzil Minion-Wong. For what it’s worth, my auto-correct changes the councillor’s name to Senile Unnamed-Wrong, which has caused some funny texts to editors. 2:53: Doug, on Toronto’s alt-weekly: “NOW is just a disgusting magazine. I would be embarrassed to be seen reading it.” Join Raccoon Nation, Doug! We have illustrations and fantasy subway maps and everything. 3:00: God bless Ford Nation, God bless every one in the city, says Doug, somehow echoing A Christmas Carol on Easter. 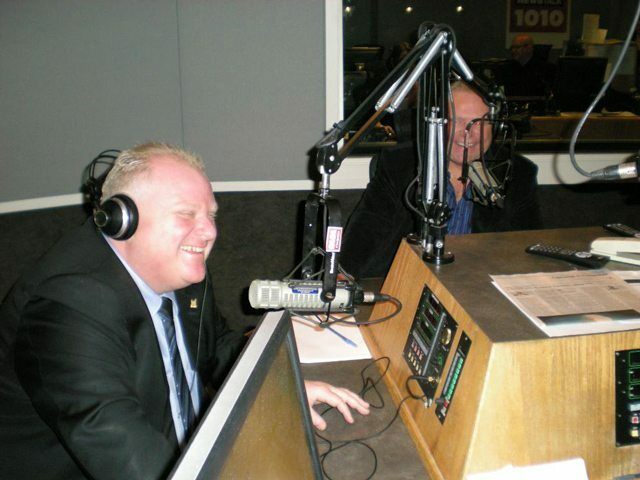 Today was the Doug Ford show, and he didn’t disappoint. He was loud, opinionated, and very passionate about the Toronto Star. Classic Doug, always saying things. As always, thanks for reading, Raccoon Nation. Four out of five Atkinson Principles.